On Sunday the 29th of July a fire burnt around a third of the Traditional Herb and Medicine Market. Video with permission from a known source. The Traditional Herb and Medicine Market is comprised of 289 permitted traders selling traditional medicine in the form of herbs, roots, dried plants, bulbs and bark. In addition, co-sharing and other retail linkages add an additional 511 traders in the market. Completed in 1998 as part of the Grey Street and Warwick Avenue Urban Renewal Program, the market makes use of two previously unutilised freeway spurs. To provide a continuous link across the rail corridor an additional pedestrian bridge was inserted between the freeway spur and an existing pedestrian bridge. Left: Aerial view of the site before the market was built; spurs in the upper left corner. Right: New interlinking pedestrian bridge being installed. Photos: Richard Dobson. At the time the new market space gave traders, who had previously been located on the pavement along David Webster Road, a more dignified work environment as well as recognizing traditional practices. It is estimated that nearly 80% of black South Africans make use of traditional medicine in addition to bio-medicine. A study has shown that there are 14000 people involved in the supply chain of the market which further confirms its importance in both the cultural and economic landscape. Historical images of traders using the new market space. Photo: Richard Dobson. The fire in the market started early on Sunday night. The fire department put it out and the city has reported that a forensic audit is being undertaken to determine the cause. Around a third of the market was burnt. According to the Herb Market Committee the fire has directly impacted 77 traders, most of whom lost their stock. It was reported that the value of the stock lost ranged from R10000 to an upward extreme of R70000. It can be conservatively assumed that the average loss per person was around R18000. As it was the end of the month many people had bought stock on credit, meaning the fire has serious implications for paying suppliers. 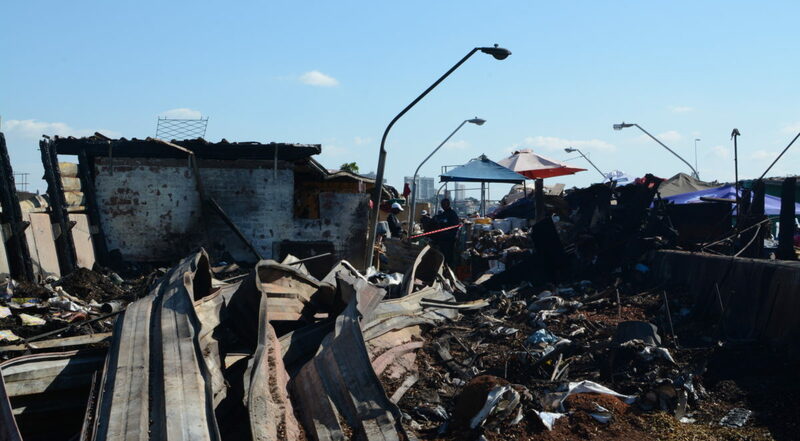 In addition, multiple traders lost their identity documents as well as money that they had kept with their stock as they perceived their place of work to be safer from fire than their homes- many of them live in informal settlements. Left: A trader sits next to stock that narrowly missed being burnt. Right: Surveying the damage. Photos: Phumelele Mkhize. Left: Fire department dampen debris on Monday morning. Photo: Rebecca Plumbley. Right: Damage from fire. Photo: Chantal Froneman. Local government response has been disappointing and limited. Nevertheless, due to the urgency of the situation within three days of the fire the traders had taken it upon themselves to clear the site of the debris. There has been a strong sense of community amongst the traders over the past week and many of those effected have had stock donated or loaned to them by their colleagues. By Thursday traders had begun reconstructing their tables and displays- buying the wooden pallets and nails needed themselves. On average it costs R350 per person to reconstruct a table. Left: Wooden pallets and a recently built table. Right: Trader building a new table. Photos: Rebecca Plumbley. Left: Members of Asiye Etafuleni staff also assisted in reconstructing tables for two traders on Friday afternoon. Right: Trader, Ms. Khoza, with her newly constructed table. Photos: Rebecca Plumbley. The urgency with which the traders undertook to clear the site and rebuild their infrastructure highlights the vulnerability of informal workers for whom re-establishing business after these kinds of disasters is critical. Whilst there has been an incredibly resourceful immediate response by the traders, larger challenges now await them. The next substantial challenge will be their lack overhead protection at start of the country’s next rainy season. The below images are comparisons of the condition of the market one day after the fire (left) and five days after the fire (right). Photos: Phumelele Mkhize and Rebecca Plumbley. An online crowd-funding campaign has been set up. All funds will be distributed directly to the informal workers to help pay off credit, restock inventory, rebuild stalls and replenish lost savings. You can contribute here. Dobson, Skinner and Nicholson. 2009. Working in Warwick: Including street traders in urban plans. Durban: School of Development Studies, University of KwaZulu-Natal.